Dr. Christine Kim decided to join the healthcare field at a young age. As the daughter of a dentist who served the needs of his patients for over 40 years, Dr. Kim was able to witness first-hand the personal relationships and professional satisfaction her father experienced. Now, as an orthodontist serving the families of Northern Virginia, she works hard to create similar relationships and foster the level of care her patients deserve. With a focus on personalized care and individualized treatment, Dr. Kim is able to facilitate positive transformations in her patients’ smiles and overall health. For her, seeing the transformation of a patient who never smiled before treatment, to smiling after treatment, is an incredible joy. Dr. Kim is a member of several orthodontic-related associations and study clubs, and attends nation-wide seminars and courses year round. These seminars and educational courses help her stay up-to- date on current and cutting-edge technologies and solutions to provide the best orthodontic care. Continuing education is a vital aspect of Dr. Kim’s commitment to serving her patients’ needs and making her the best orthodontist she can be. Originally from Alexandria, Virginia, Dr. Kim moved to the Tysons Corner area after her orthodontic residency to be closer to her family. She has two wonderful parents and an older sister. Bella and Ellie, her Malti-poos, are her little furry bundles of happiness who you might even see in the office once in a while. When she is not in the office, you can find Dr. Kim with her family and friends. She also loves being outdoors, even if it’s just for a short walk or hike. 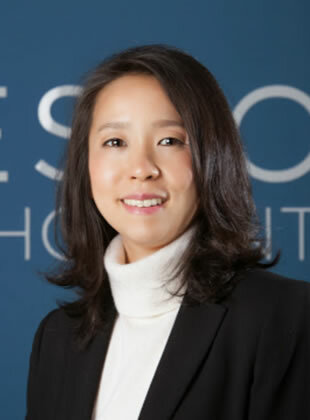 Dr. Kim grew up playing tennis competitively on the national level, and played on a full scholarship at UVA. On the weekends, she teaches tennis, and hopes to cultivate the same strong work ethic she learned from her coach to young players now.